In this age of globalization, people consider internet an authentic source of information. By using countless search engines, you can simply dive into the depths of any topic. But what if your posts did not save and faced deletion before anyone views it? Therefore, to save you here is the simple way to save your posts. 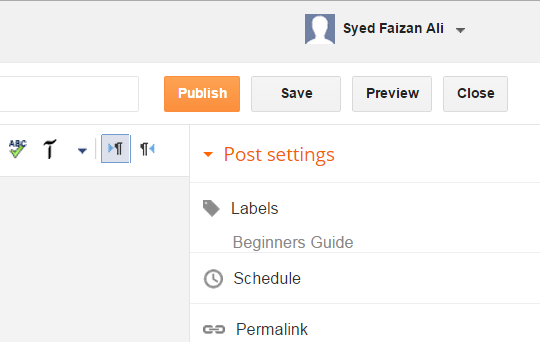 In this article, we will show you how to save or preview posts in blogger. Why to save posts to Draft and then preview them? In order to avoid inconvenience, it is suggested that one should never compromise his work. If you made a post on blogger, and have some doubts about it which you want to be cleared before publishing, you can easily save it. Yes! Blogger now provides you the opportunity to save your posts instead of discarding them for some issues. Later, when you will sign in you can view your post and before publishing on any internet forum you can preview it to check how it would look. Now the question is how you can do this all. Below is the simple way to save and preview posts in blogger. How to Save and Preview Posts in Blogger? Then on the upper right hand side you can see two buttons named ‘Save’ and ‘Preview’. You can click either of them depending on your requirement at that moment. In case you are not hitting the save button manually, blogger automatically saves your posts upon each edit you made to your content. I Hope this tutorial have helped you in learning how to save posts to draft and preview them in blogger. Do share your thoughts abouts this feature, how saving and previewing helps you? Write your opinions in the comments below. This is the most useful feature in the the blogging community. Thanks for the beginner tutorial Syed! Still couldn't figure out how to get a preview on my PC that shows how the page would look like on a smartphone.